Ugh. Moon took my hat!! Impressive how you drew a lot of poses, feels very alive. Neat concept! itch.io Community » Game Development » Devlogs · Replied to Gogglehead in The Superpowers game maker #MegaThread! Go to 3D view and double-check the depth of the various actors. Make sure the camera's viewport contains the sprites on the Z axis. That's probably the issue. There is no "cameraPixelPerUnit" but for an orthographic camera, the orthographic scale is the vertical number of world units that will fit on screen. The horizontal number of units can then be calculated by dividing by height and then multiplying by width (aka. multiplying by the screen ratio). Will be fixed for the next release. "Where's my data stored?" in http://docs.superpowers-html5.com/en/getting-start... should help. What's a repository in this context? Can you explain what is Antergos? Did you not install Superpowers by downloading it from https://sparklinlabs.itch.io/superpowers? I don't think anyone is working on it at the moment. If you start working on it, just post a comment on the issue on GitHub so people know you are. Superpowers community » SUPERPOWERS — HTML5 2D+3D GAME MAKER » Superpowers Discussion · Posted in A little detail about "search"
Search is provided by the CodeMirror editor widget. I think the best approach would be to submit an enhancement request or a patch to CodeMirror's search.js addon, and then update Superpowers to use that new version of CodeMirror. Would be much simpler than trying to fork and maintain our own version of it, which would become an on-going maintenance burden. Superpowers community » SUPERPOWERS — HTML5 2D+3D GAME MAKER » Superpowers Discussion · Posted in How do I view the code output of the GUI Scene Editor? The scene editor doesn't generate code, it generates a JSON description which is then used to build the actors. Superpowers community » SUPERPOWERS — HTML5 2D+3D GAME MAKER » Superpowers Discussion · Posted in Running from a console? i lov yuo cooldog. edit: thanks for teacing me how to type!! Superpowers community » SUPERPOWERS — HTML5 2D+3D GAME MAKER » Superpowers Discussion · Posted in How about go Steam for visibility? Hey! I think we should look into it (and decide whether submitting to Steam is a good idea or not) after the redesigned app (v1.0 and beyond) is out. Thanks for the video! You can enter the mine with the weapon you get during the first boss fight. Some GPU drivers seem to have issues with the various shaders on Linux and OS X. Are you running one of those? Try updating the drivers if possible. Everything looks good except for the fact that your server isn't running. Did you uncheck the "Auto-start server on startup" checkbox on purpose? If so, you need to click on "Start". Looks like a GPU driver bug, not much we can do about it on our end I'm afraid. OK so the fact that one can't include manage a subtree as its own git repository is indeed not very convenient. But I'm not very enticed by the idea of complexifying project structure with nested entries.json. What do others think? We haven't really given much thought to reusable engines built *within Superpowers*. I mean, there are project templates (which you can put in systems/game/public/templates) which are one approach, but it's not quite the same. Maybe your engine would be best built as a plugin for Superpowers Game? It could expose its API like the sound play exposes its API for instance: https://github.com/superpowers/superpowers-game/tr...? I feel like that's a good match. It would be a very simple plugin that only have a typescriptAPI bundle and no editors or data folder. You can upload them to http://imgur.com or any other services and post the link here. Can you post a screenshot of your server list in the launcher? Also of your server's settings tab? That should help diagnose the issue. La démo RPG le fait : http://bitbucket.org/sparklinlabs/superpowers-rpg-..., tu trouveras peut-être ton bonheur dedans ? Sinon hésite pas à nous montrer le problème que tu rencontres spécifiquement. Y'a des chances qu'on utilise des trucs qui ont été ajoutés dans la version de développement donc ça m'étonnerait pas que le jeu ne marche pas avec la v0.19. Si tu lances avec F6 ou bien si tu appuies sur F12 pendant que le jeu tourne, tu pourras voir les éventuelles erreurs dans la cosnole. If you do edit the script files on disk, make sure to do it while your server is off, otherwise it might overwrite your changes. Global replace would be a nice addition, just created a ticket for it on GitHub. Superpowers community » SUPERPOWERS — HTML5 2D+3D GAME MAKER » Superpowers Discussion · Posted in Visual novel? 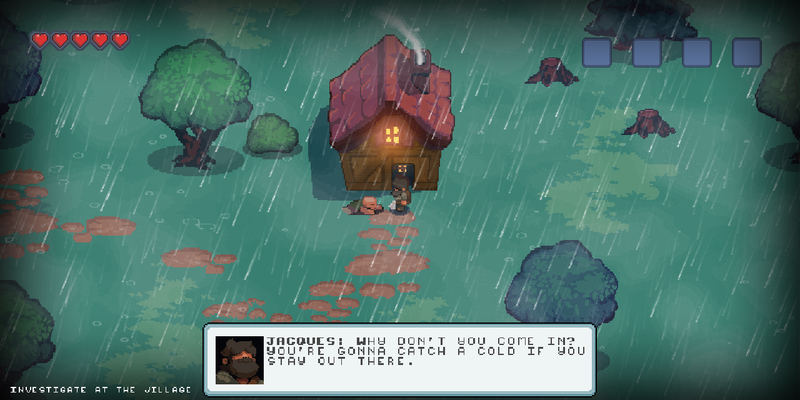 The Superpowers RPG demo project might help, it has dialog boxes and 2D exploration. It's not quite what you're looking for but should be a good start to learn how to build your own. itch.io Community » Game Development » Devlogs · Posted in The Superpowers game maker #MegaThread! Hey! I haven't posted here in a little while! Make sure to check out This Week in Superpowers #2 and This Week in Superpowers #3 for the latest development and community news. Loooots of stuff has happened. Last week end, we took part in the Global Game Jam and made Lumberjack Jacques and the Ritual of Doom. It's been a year and a half since the three of us started working on Superpowers. Thanks to generous support from the community on Patreon and during early access on Gumroad, we've been able to do it full-time so far. But with our current financial situation, we can't afford to keep going like that for much longer. So we've been looking for work on the side, in order to continue this awesome beast of a project... and, well, good news! Bilou and I have found long-term gigs and Pixel-boy will be doing some contract work soon. What does that mean? Well, we'll definitely have less time to spend on Superpowers every week. Buuuuut! now we don't have to worry so much about making rent every month, and it's remote work with a pretty flexible schedule so, short of being paid to work on Superpowers itself full-time, it's the best outcome we could hope for! superpowers-asset-packs — Our asset packs are now CC0-licensed! Check out the latest edition of This Week in Superpowers for info about the next release and why we haven't pushed out a v0.20 yet. Each marker has the Teleport Behavior on it and will check if the player is close enough before fading out and loading the new map. It's planned! We'll have user settings soon (see https://github.com/superpowers/superpowers/issues/...) and that will allow customizing things like the text editor theme. At the moment, Superpowers Game has a socket.io plugin for the client, but for the server part, you'll need to use Node.js directly. We have plans to build a "Superpowers Server" project type later! I believe it's the Games from Scratch tutorial that needs to be updated. I'll let them know. Haha, I wrote the "crazy in the coconut" bit and it definitely comes from Frontier Psychiatrist, now that you mention it :D. Glad you liked the game! "Error creating WebGL context" seems to indicate some graphics driver issue. A reboot or driver update might fix it! Since we're hosting a weekly livestream in French, we thought it'd make sense to have something for the English community too. we've just kicked off a weekly community report on our new wiki! Check it out, it's called: This Week in Superpowers #1! And if you need to build a complex reusable actor made of multiple components or with children actors attached to it, you can build your reusable actor hierarchy in a separate scene and then import it many times in your main scene with the "New Prefab" button. Hmm, that's weird. Can you open the devtools with F12 and report any errors in the Console tab?